On the afternoon of Monday, June 30, 2008, three Continental Airlines flight attendants were injured in flight during the cruise phase of a flight between Houston and Fort Lauderdale. The incident happened when Continental Flight COA1448, a Boeing 737-300 aircraft, encountered turbulence at 31,000 ft above the Gulf of Mexico. The Sun-Sentinel identified the injured flight attendants as Newark-based crew, and reported that their injuries happened when they either fell or hit their heads. News reports, quoting Broward Sheriff Fire Rescue spokesman Mike Jachles, said that the injured flight attendants were first treated at the gate area after landing, and then taken to Broward General Medical Center for treatment of non-life threatening injuries. No passengers were injured in the incident. A former NetJets flight attendant filed suit in New York late last week against Jennifer Lopez and her company, Nuyorican Productions, Inc., alleging that a dog belonging to the actress attacked her during a flight between Farmingdale, NY and Burbank, CA on July, 3, 2006. The flight attendant says that the dog, a German shepherd named Floyd, lunged at her as she passed by in the passenger cabin of the Gulfstream IV, and bit her pant leg. When the flight attendant twisted to get away from the dog, she fell, injuring her back. According to documents filed in court, the flight attendant began treatment for back pain within days of the incident, but was unable to achieve relief from her pain. As a result of the injuries, the flight attendant had to have major surgery on her back in April of 2007, and she continues to undergo treatment. The lawsuit alleges that the flight attendant's injuries are permanent and will require additional treatment. She has been unable to return to work. She is seeking $5 million in compensation. The flight attendant's attorney was quoted in a number of news reports such as this one in the New York Daily News, saying she is not out to capitalize on J. Lo's celebrity, and had made attempts to settle the case that were ignored. NetJets is not named in the suit. Predictably, this story quickly went viral, spreading like wildfire around the Internet, especially on celebrity gossip websites. Once that happens, stories begin to mutate and become sensationalized, like an earlier story about Jennifer Lopez and a flight attendant that I wrote about on another blog nearly two years ago. If you are interested in the details of this incident, I suggest that you read the actual court documents (8-page 'pdf' file), posted to the Internet by TMZ.com, and that you take many of the accounts in the entertainment media with a grain of salt. My sympathies are with the injured flight attendant. On Thursday, June 26, 2008, eight people on a Cathay Pacific Airways flight were injured when the aircraft encountered severe turbulence during its landing descent. The incident happened when Cathay Pacific Flight CX708 , an Airbus A330-300 with 241 passengers and 12 crew on board, was within minutes of landing at Hong Kong after a scheduled flight from Bangkok. According to several news reports, five passengers and one flight attendant were treated at Princess Margaret Hospital hospital for minor injuries and released. Two other cabin crew members remained in the hospital with more serious injuries. An article about the turbulence incident on AviationRecord.com quoted a statement from Cathay Pacific, which said that "Flight CX708 encountered the turbulence when the 'fasten seatbelt' sign had been illuminated about 12 minutes prior to landing." The captain sent a message about the incident, so that ambulances were waiting to transport the injured as soon as the aircraft landed. Hardly a week goes by when there are no reports in the news about passengers behaving badly in flight (and we all know that many such stories never get reported by the press). A recent story about a disruptive passenger on a JetBlue flight seemed worse than most. Of course, as is so often the case, the incident centered on an intoxicated passenger. On June 17, 2008, a 35 year old woman passenger on JetBlue Flight JBU643 decided to smoke a cigarette during the transcontinental flight between New York (JFK) and San Francisco (SFO). She was seated in an exit row on the Airbus A320, and that is where she reportedly lit up. When a flight attendant intervened, asking the woman to extinguish the cigarette, she allegedly became belligerent and abusive. She was forcibly moved to a seat away from the exit row and was restrained. In fact, she was restrained twice, since she managed to break free the first time. In the course of the altercation, the intoxicated passenger allegedly punched a JetBlue flight attendant in the jaw, and also shouted abusive language at him, including racial slurs. The flight was diverted to Denver International Airport, where the belligerent woman was arrested. All the awful details of this incident can be found in the FBI affidavit posted on SmokingGun.com. Earlier this week, an Air Canada flight en route from Vancouver to Ottawa diverted to Winnipeg due to what news reports variously referred to as smoke or "an electrical odor" inside the aircraft's cabin. The incident occurred on Monday, May 12, 2008, on board an Airbus A321-200 aircraft, operating as Air Canada Flight ACA138. The aircraft made a safe emergency landing at Richardson International Airport in Winnipeg. The Winnipeg Sun quoted an Air Canada official who said that one flight attendant required medical attention after breathing in fumes. No one else was injured. The incident was attributed to "a malfunction in the electrical system." Other news reports specified that the fault was in a fan motor. Earlier this week, a United Airlines flight encountered severe turbulence while en route from Denver to Phoenix. Several people on board were injured, including at least one flight attendant. The incident happened on the evening of Tuesday, April 15, 2008 on United Flight UAL 1427, an Airbus A320 aircraft. According to news reports, the turbulence began about 30 minutes after the aircraft departed Denver International Airport. The aircraft turned back to Denver where it landed safely. ...When the Airbus A320 hit cruising speed, the seat-belt sign was turned off, flight attendants started serving drinks and Holland began working on his laptop. Then there was a bump caused by turbulence, which seemed normal at first, Holland said. The beverage cart bounced around and the drinks and cups spilled out, he said. One flight attendant was thrown to the ceiling and passengers’ personal belongings – including Holland’s laptop – flew into the air. Mr. Holland added that the flight attendant who hit the ceiling recovered enough to continue working on the way back to Denver, but that another flight attendant required medical attention. He also observed a passenger with "a bloody face" who, he said, "needed paramedics to help her off the plane." An article about the turbulence incident on the website of Denver television channel CBS 4 mentioned that one passenger and one flight attendant who were injured were hospitalized. The CBS 4 article includes a video clip that includes comments from a passenger who was on board UAL Flight 1427. Former professional football player Tyoka Jackson (in photo at right), who had been a defensive lineman for several NFL teams, was ordered by a federal jury to pay a flight attendant $3,000 for an incident that happened on board a Northwest Airlines flight between Memphis and St. Louis in 2005. According to a news story in the St. Louis Post-Dispatch, the flight attendant testified in court that Mr. Jackson pushed him, sending him "toppling onto a passenger and the armrest in seats across the aisle." Jackson was said to be upset because the flight attendant asked him to stow a laptop bag under the first-class seats. Jackson's attorney, Tom Magee, said in his opening statement that Jackson "used only such force he thought was necessary to stop this man from touching him against his wishes. He was not trying to hurt him." [The flight attendant] testified that Jackson did "not simply push me, he threw me across the airplane." "His hands came up so fast and hit me in the chest, and back I went." The flight attendant also testified that he suffered back pain, a deep leg bruise and anxiety. He said he finds it hard to work because he now fears confrontations with unruly passengers. In their suit against Mr. Jackson, the flight attendant and his wife had asked for more than a million dollars, but last week jurors ordered Mr. Jackson to pay $3,000 to cover medical expenses incurred by the flight attendant, according to the Associated Press. Tyoka Jackson played professional football in the NFL from 1994 through 2006, most recently for the Detroit Lions. Earlier he had played for the Miami Dolphins, the Tampa Bay Buccaneers, and the St. Louis Rams. A Mesa Airlines flight attendant was severely injured last month when the flight on which she was working encountered serious turbulence over Colorado. She was knocked unconscious, and suffered spinal injuries that required surgery. The incident happened on the morning of February 3, 2008 aboard a DeHavilland DHC-8-202 (Dash-8) turboprop aircraft. The aircraft, operated by Mesa Airlines as Air Shuttle Flight ASH 7106, was approaching Denver on a scheduled flight from Casper, WY when it encountered "serious turbulence." ... the flight was descending on the RAMMS 5 STAR (Standard Terminal Arrival Route) and was encountering "light chop." Approximately 5 miles inside RAMMS intersection, as it was descending from 14,000 feet to 13,000 feet, the flight encountered severe turbulence. The captain called the flight attendant on the intercom, but she did not answer. An emergency medical technician (EMT), who was a passenger on the flight, answered and reported the flight attendant was lying on the floor unconscious. The NTSB notes that the captain suffered "minor injuries" in the same incident, however there were no injuries to the first officer and 19 passengers aboard the flight. A number of people were reported to have been injured early on the morning of Monday, January 21, 2008 when a United Airlines flight encountered turbulence. United Flight UA 1028, a B-757 aircraft, was at FL370 en route from Los Angeles to Chicago when the incident occurred, according to a preliminary incident report posted this morning on the FAA website. The aircraft diverted to Denver, where it landed safely at around 03:00 AM local time. The FAA report states that three flight attendants sustained "minor" injuries. There was no damage to the aircraft, which later resumed its flight to Chicago without further incident. In contrast to the information posted by the FAA, several news media stories about the incident reported that up to 10 people had been injured. The flight was said to have had 180 passengers and seven crew members on board. UPDATE January 24, 2008: Here's a link to a first person account of this incident by a passenger who was on board UA FLight 1028 that night, from the Denver Post. The cabin crew of the British Airways B-777 that crash landed at London's Heathrow Airport (LHR) on January 17 are being praised for their quick action and professionalism in initiating and carrying out the evacuation of the aircraft. 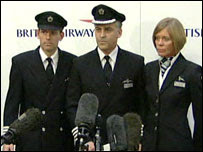 Pictured at right are the senior crew members from BA Flight 38. From left to right, senior First Officer John Coward, who was the pilot flying at the time of the incident; Captain Peter Burkill, pilot in command; and Cabin Service Director Sharron Eaton-Mercer, the senior cabin crew member on the flight. "I want to pay tribute to the cabin crew and Cabin Service Director Sharron Eaton-Mercer who carried out the evacuation of the passengers with speed, efficiency and care, some incurring minor injuries in the process. It was typical of Sharon's selflessness that she took time to check that we on the flight deck were all right before going down the chute herself." The cabin crew were praised as well by British Airways CEO Willie Walsh. A number of passengers who had been on board BA Flight 38 also commented publicly that the cabin crew had remained calm and had quickly evacuated all the passengers in an orderly fashion. The incident that resulted in the crash landing occurred very late in the flight, while the aircraft was on short finals. The flight deck crew had not been able to warn the cabin crew before the aircraft hit the ground. The cabin crew reportedly initiated the unplanned evacuation as soon as the aircraft came to a rest. The United Kingdom's Air Accident Investigation Branch (AAIB) has issued a preliminary report on the accident, excerpts of which have been posted on the Professional Pilot News blog. The report noted "minor" injuries to four of the crew. The report also notes that nine passengers also sustained injuries: eight classified as "minor" and one "serious." This is in contrast to press reports that had said there were no serious injuries. The AAIB investigation is continuing. Early this morning, and Air Canada Flight AC190 with 83 passengers and five crew on board experienced a serious turbulence incident during a scheduled domestic flight between Victoria, BC and Toronto. The A319 aircraft diverted to Calgary for an emergency landing shortly after the incident. Ten people, including two crew members, were hospitalized in Calgary with what have been described as "non-life-threatening" injuries. My understanding is that both crew members who were injured were flight attendants, although this has not been officially confirmed at this time. Those hurt in what was described as sharp drops in altitude and violent rocking were rushed to Calgary hospitals, where their injuries were deemed to be non-life-threatening. Others were treated and released. "It happened very fast," a female passenger in the plane's front cabin told CBC Television. "One side of the plane just went up a little bit sideways and then it just sort of went back down. And our friend was really hurt ... she flew up and hit the ceiling and (came) right back down." An article about the incident in the Toronto Star quoted a passenger who praised the cabin crew, saying, "The flight attendants were amazing, because a lot of them were injured themselves so they had cuts and were trying to dab blood out of their eyes." A statement about the incident on Flight AC190 on the Air Canada website this afternoon said, "... Of the ten individuals transferred to hospital with non-life threatening injuries, at this time seven have now been released. The remaining two passengers and one flight attendant in hospital are in stable condition. Other passengers are continuing their onward travel." Best wishes for a speedy to all those who were injured. Last week the U.S. House of Representatives passed the FAA Reauthorization Act of 2007, H.R.2881, by a vote of 267-151. The legislation includes a number of provisions of interest to flight attendants in the United States. The Association of Flight Attendants (AFA) issued a news release about the legislation that summarizes the main points that affect flight attendants. There are several important provisions included in the FAA Reauthorization that AFA-CWA has repeatedly requested for years. For the first time in over 30 years, a requirement for workplace safety and health protections for flight attendants was finally recognized. Flight attendants suffer numerous occupational injuries and illnesses while working aboard commercial flights at rates several times higher than those for all private industry workers, yet are not covered under Occupational Safety and Health Administration (OSHA) guidelines. The FAA Reauthorization also states that the FAA must institute a HIMS, or "Return to the Cabin" Program, that will allow flight attendants an opportunity for rehabilitation after testing positive for drug or alcohol abuse. The House also instructed the FAA to complete studies on flight attendant fatigue and continue sampling and analyzing onboard cabin air. The FAA must also initiate a study of actual onboard temperatures to determine if regulations are necessary to mandate standard temperatures onboard aircraft. Protection for seniority integration in case of an airline merger was also included. This provision will help to ensure that, in the event of an airline merger, all employees are treated fairly and one group is not stapled to the bottom of the merged seniority list. Additionally, the bill mandates that airlines must notify passengers upon ticket purchase if their aircraft is subject to pesticide spraying. Also of interest, an amendment to the bill (H.AMDT.808) asks the Secretary of Transportation "to issue regulations requiring air carriers to provide initial and annual recurring training for flight attendants and gate attendants regarding serving alcohol, dealing with disruptive passengers, and recognizing intoxicated persons. 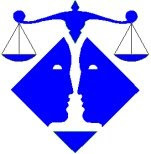 The training must include situational training on methods of handling an intoxicated person who is belligerent." The U.S. Senate will consider this legislation some time next month. If the legislation passes the Senate as well, it will be presented to President Bush for his signature. Were Flybe cabin crew sickened by fumes in aircraft cabin? Two cabin crew members became violently ill and collapsed during a recent Flybe flight on a BAe 146 aircraft between Birmingham, England and George Best Belfast City Airport in Northern Ireland. The Transport and General Workers' Union, which represents Flybe's cabin crew, says the crew members' illness was caused by a "toxic gas" in the aircraft cabin. The union is calling for an investigation. A news article about the incident in the Belfast Telegraph quotes union officials who say this was "the latest in a number of potentially disastrous mid-air incidents in which crew members working for various airlines have become dangerously ill during flights." Campaigners who believe the incidents are due to deadly toxins from jet engine oil contaminating the air supply have warned that the 'fuming' incidents are putting the long-term health of crew and passengers at risk and are also in danger of causing a major air catastrophe if pilots become incapacitated. 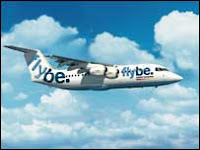 Details have emerged in a CAA report into a terrifying episode last month on board the Flybe jet. Passengers on board the BAe 146 plane flying into Belfast from Birmingham were completely unaware of the drama at the rear of the aircraft, and of the fears of other terrified cabin crew that they may not have been able to deal with an emergency with incapacitated staff. Dessie Henderson, senior organiser of the Transport and General Workers' Union in Belfast, says it's just one of an increasing number of 'fuming' incidents which are feared to be leaving airline staff and passengers facing possible long-term health problems due to so-called "aerotoxic syndrome". Mr. Henderson went on to say, "There have been numerous incidents and they can't continue to go unexplained when the health and safety of the cabin crews and the passengers on board the planes are at stake. If these incidents are down to organophosphates, then that is what the airlines need to be carrying out checks for, to see if their staff and our members have been exposed to it." While declining to comment on the specific incident, a spokesman for Flybe said that all of the company's aircraft are manufactured and maintained to the highest industry standards. "Any incidents involving sickness experienced by cabin crew, flight crew or passengers are taken very seriously by the company, with appropriate medical support always provided. "The statistically very small occurrences of on-board sickness indicate that our systems and processes are robust and more than meet all CAA regulatory demands. "Flybe are at the leading edge of co-operative joint research in this area and are comfortable that our expertise marks us out as industry leaders." The UK The Government's Committee on Toxicity is said to be examining the threat from contaminated cabin air. Two Southwest Airlines flight attendants and a passenger were injured earlier this week when the B737 aircraft they were on encountered inflight turbulence. The incident happened on July 2, 2007 aboard Southwest Flight 1527 which was en route from Tampa to Fort Lauderdale with 76 passengers and five crew members aboard. 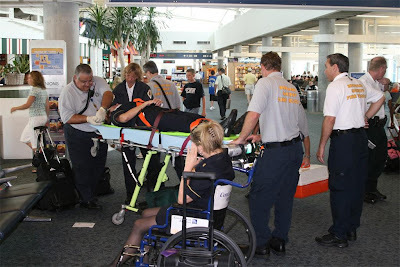 According to an Associated Press article about the turbulence incident, published by Forbes.com, reported that paramedics examined the injured people after the aircraft landed at the Fort Lauderdale-Hollywood International Airport. The passenger was examined and released, while the flight attendants were taken to a local hospital. One flight attendant had an injured ankle, and the other injured her shoulder. The FAA preliminary report about the incident described the injuries as "minor" and noted that there was no damage to the aircraft. The U.S. National Transportation Safety Board (NTSB) has issued a report on an incident in which two flight attendants and one passenger were injured during turbulence. The incident happened on the morning of April 28, 2007 aboard an Executive Airlines ATR 72-212, operating as American Eagle Flight 5089 from Nevis Island to San Juan, Puerto Rico. The Director of Flight Safety for Executive Airlines said that a few minutes after the Captain made the announcement to prepare for the approach to land at San Juan, Puerto Rico, he alerted the flight attendants of the possibility of encountering turbulence, and asked that everyone remain seated. According to the Director of Safety, the captain then initiated the descent, and the airplane entered a broken layer of clouds, encountering light turbulence, followed by a momentary "jolt" of turbulence. As the airplane encountered the momentary "jolt", both flight attendants who were walking to their seats, and one passenger, who had been in the lavatory, were thrown and received injuries. The report says that the passenger was injured seriously. The flight attendants' injuries were described as "minor." Neither the pilots nor any of the other passengers were injured, and the aircraft did not sustain any damage. Last week four United Airlines flight attendants were injured during in-flight turbulence. One of the flight attendants suffered a broken leg. Injuries to the other three were considered to be minor, according to a preliminary report about the incident by the National Transportation Safety Board (NTSB). The captain reported to United Airlines safety that while at flight level 300 (30,000 feet) the flight deck received information about turbulence below 12,000 feet. The captain advised the flight attendants to have the cabin secured and be in their seats within 15 minutes. Approximately 17 minutes later, while descending through 15, 500 feet, the airplane experienced 1-second of moderate chop. The cabin reported injuries to all flight attendants and no injuries to passengers. All four flight attendants received medical attention after landing. One flight attendant was seriously injured with a closed fibular fracture; the three other flight attendants had minor injuries. Neither pilot was injured, and there was no damage to the aircraft.